Imperial Knight Conversion: Pt. 3 — Legs and ankles. I filled in the hollow lower leg with resin. Or at least, I tried to and it ended up overfilling and spilling over. I got most of it off, but you can see bits around the details. 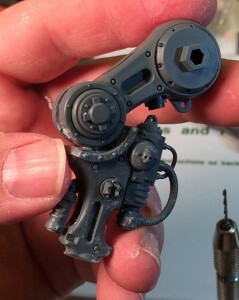 I beat myself up over this until I remembered that I plan on heavily weathering the lower legs and it do nicely as thick rust, grimed up oil, etc. I added a thick blob of automotive two-part epoxy putty (JB Weld in the US) in the knee joint of the upper leg, and wedged the new knee joint into it after it had set up a bit. That gave the knee a very solid seat to slot into. It also allowed me to get the pose just right. Drilled and pinned the now-hard putty and knee joint for good measure. It was now firm enough to hold nicely without any glue. I slathered it with Zap-a-Gap anyway, natch. Here you can see the knee pose of the right leg. 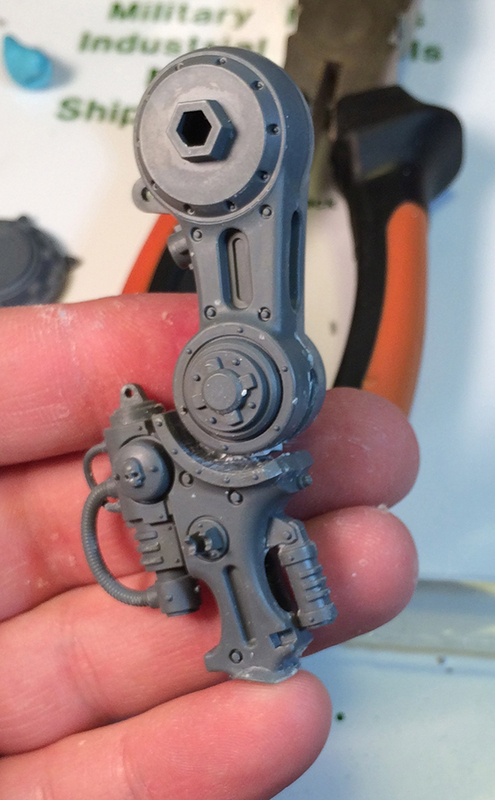 Note that I also cut away the pistons on the front and back of the leg, as well as the ankle joint. These would all need to be rebuilt to get the dramatic leg repose I was looking for. And here’s the left leg. Same story, really. I should mention that I had to carve out space for the plastic sprue joint to plug into the knee, as the original model’s pose had the hole in the wrong spot. After I got these pinned and glued in place, I added green stuff and Milliput and rebuilt the joint so it would look just like the original. I’m big on that. It’s got to look like it was built that to do what I wanted to do. Very carefully cut the tips off the pistons and keep track of them. I like to push the bit into a small blob of Blue Tack when I do this so it doesn’t go flying when you cut it, because carpet. Cut the lower bit from the bottom of the piston mechanism. Note there’s a collar here that is very thin. While nobody will notice if you slice it off, you will be sad every time you look at it. Drill out the top piston AND bottom ball with a bit the right size for your plastic rod. Remember to start with a smaller bit, and go bigger if you need to. 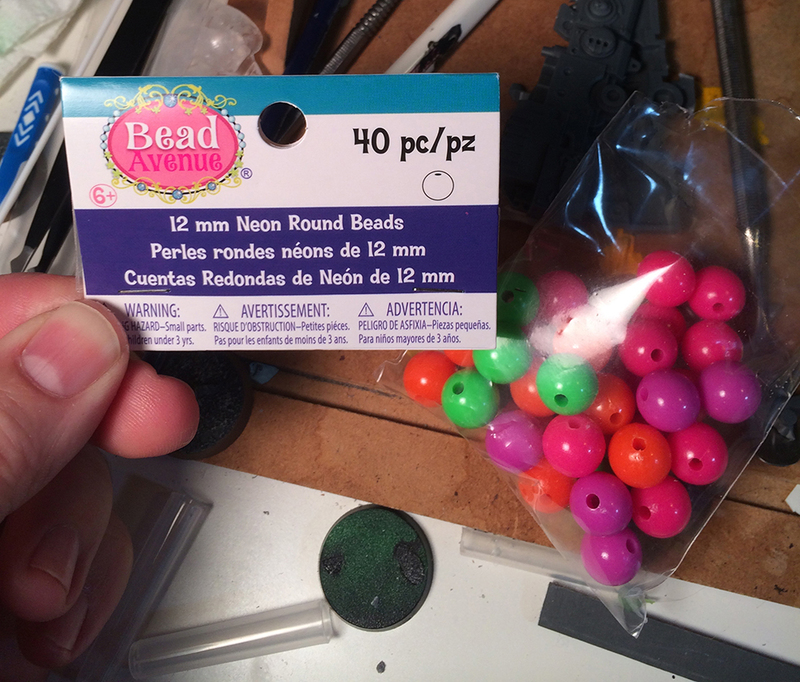 The ball bits are super tough, as they’re hard to hold. I ended up holding the drill in place and sort of rotating them around the top like chalking a pool cue. The two rear-leg pistons are different because they’re thicker. Those ones were easier since I didn’t have to mess with the ball joint on them. 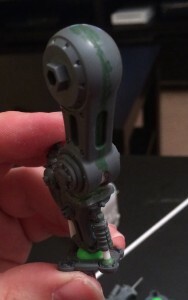 The rest took some green stuff to smooth the gray plastic into the plastic rod. I just put a thin sausage around the lip and used the side of a brush to get an even curve around the sides. The coolest thing is that, at this point, if you drill out enough of the top these are all working pistons. This was important for me as I didn’t know exactly what position the feet would be in yet. 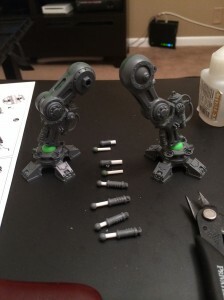 I was able to play with them quite a bit to get the feet just right before I glued anything. See these? They’re going to be new ankles. I tried to salvage some of the original bits, but it wasn’t working out. I ended up picking these up at a craft store. My daughter will enjoy the rest. I cut two in half and then had to really sand them down to the right shape and size as they were a shade too big. This was pretty hard plastic, too. The upside is that they came pre-drilled! Bonus. Here you can see a leg with some test fitting going down. Once the position was settled I added in the putty around the ankle to blend it on and pinned the ankle to the bottom of the leg (filled with resin, remember?). I played with some gap filling at various points here. You can see some Liquid Green Stuff but that isn’t really still on the model at this point. Here’s something like a final dry-fit of the two leg reposes. None of it’s really glued here. After messing with the legs for a while, I moved on to the upper body, so let’s check that out next.